This 70-minute educational atomic theory animation shows the experiments and foundation work by Dalton that lead to atom. It presents the story of his logic, flaws and subsequent modifications to the model. It is meant for high school and college physics classes. * Nature of matter prior to Dalton. * Law of combining volumes. The groundwork of the first atomic model was laid by Dalton around 200 years ago. Using only his intellect and experiments he peered deep inside matter to see atoms. This animation takes you through the journey his discovery. The animation brings out clearly the laws of conservation of matter, definite composition and multiple proportions. Also explained are how Dalton could link the physical matter to unseen atoms and the method by which he calculated the mass of an atom. The model proposed 200 hundred years ago was later modified by other scientists to include such corrections like diatomicity of gaseous atoms , divisibility of atom etc. Each point is animated for clearer understanding. The basic laws of chemistry are based on fixed patterns followed by elements in their reactions. The groundwork done by Dalton, 200 years ago, with his law of multiple proportions was however path breaking and raised the ceiling for scientific quest. The law broke through mist of visibility and of volumes and weights and took science deep down to atoms. The model of the atom he established held on for a century and though was modified later, yet remained a source for other models. This 70-minute science animation presents the story of his logic, the flaws and the modification. Law of conservation of matter : Shown through a common occurrence of wood burning. 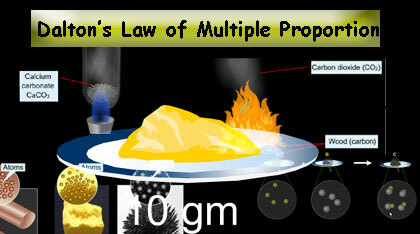 Law of fixed composition (law of definite proportions): Animated presentation of Louis Proust's copper carbonate decomposition and other examples like limewater experiment with CO2 and CO.
Law of multiple proportions :Proved taking oxides of Nitrogen example. How could Dalton link the physical elements to the unseen atom? : A logical and detailed, step by step treatment of Dalton' s theorization that gives an insight how could use the same information available with everyone to see atoms where others saw matter. Included in the animation is a note on Dalton's imagination for understanding his methods and the subsequent establishment of law of multiple proportions. Explanation: Law of definite proportions: The law is re-explained using Dalton's atoms. Law of conservation of mass: The law is re-explained using Dalton's atoms. Flaws of Dalton's Atomic Model: Dalton's law failed in periodic table, compounds and spectrum, these shortcomings led to its modification. 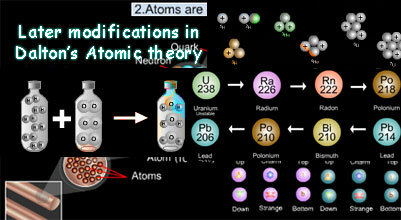 Later modification of Dalton's atomic theory: A number of modifications that took in the Dalton's models are explained here including divisibility, destruction, radioactive decay, isotopes of atoms and diatomicity of gases. Ans: All matter consists of made up of tiny indivisible particles called atoms. Atoms are indestructible and unchangeable by chemical or physical changes. Elements are characterized by the mass of their atoms. The atoms of an element are identical. Elements react to form compound (s) their atoms combine in simple, whole number ratios; there could be more than one ratio to form multiple compounds. In a given compound, the relative number and kind of atoms are constant. Ans: Dalton’s model fell short on many counts to fully explain the atomic model like Similarity of elements in a particular group, what was the cause of compound formation, emission spectra etc. This led to modification in the Dalton’s model, however this does not discount the brilliant work of a scientist that was way ahead of its time and laid the foundation of atomic theory. Ans: Briefly, Dalton’s work was influenced by Proust’s law of definite proportion and his own study of partial pressure of gases as a metrologies and later through his experiments, as per his lab notebook it was as early as 1802 that started thinking in that line and in the paper on “Proportion of the gases or elastic fluids constituting the atmosphere”, he had established the basis and later in 1805 finally produced a paper on law of multiple proportion. Ans: Thanks for your enquiry, You can purchase and download the products to your computer and show them at school, but if your school wants to retain them then it will need to purchase a school site license.